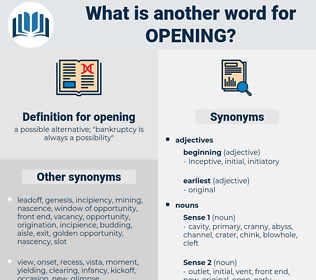 What is another word for opening? a possible alternative; " bankruptcy is always a possibility"
open-door, open-mindedness, outward-looking, open-, teething, open-ended, re-opened. paragraphs, open-mindedness, convening, closing, outset, operating, teething, inclusion, Disconnecting, pioneer, Booting, premiere. initiated, paved, discovered, conquered, attended, shot, found, Began, appropriated, unlocked, inauguration, closing. deepening, Incorporating, Involving, Exploring, Inaugurating, happening, broadening, developing, accommodating, Generating, Exposing, Presenting, Discovering, implementing, initializing, Deploying, pointing, connecting, Liberalizing, concluding, Originating, Employing, expanding, Opportunities, integrating, Instigating, Preparing, enabling, Instituting, proceeding, performing, deregulating, Announcing, leaving, reforming, Facilitating, identifying, moving, freeing, activating, accessing, increasing, provide, Providing, accepting, joining, leveraging, Conferring, authorising, Organizing, Embarking, conquering, determining, Channelling, Permitting, Authorizing, becoming, revealing, being, conducting, answering, embracing, Unlatching, Extending, Including, Allowing, breaking, rendering, Harnessing, Establishing, attending, Addressing, using, shouting, Receiving, orders, importing, prevailing, Committing, keeping, ensuring, going, giving, Arising, detecting, emerging, Maintaining, Delivering, Relating, amend, Having, turning, forging, reaching, Submitting, services, Adjusting, Admitting, Displaying, qualifying, tourism, rolling, absorbing, acquiring, Ushering, Throwing, issuing, posting, find, clearing, Granting, putting, Burrowing, urging, raising, paying, authoring, relaxing, creates, paving, according, tackling, soiling, showing, Carrying, Hosting, bearing, serving, heading, charting, Linking, driving, seeking, wearing, taking, Adding, banking, letting, winning, standing, Lifting, dumping, speaking, yakking, releasing, Doing, getting, trying, making, commissioning, convening, operating, teething, liberalising, opportunity, Booting. initiated, Entered, Begun, Instituted, commissioned, Undertaken, expressed, sent, conducted, mounted, called, unlocked. commences, begins, increases, observes, allows, establishes, arises, remarks. lay, inaugurate, pave, liberalize, liberalise, institute, embark, broaden, instigate, pop, usher, proceed, pioneer. opening-up, open-minded, maiden, inaugural, editorial. initiation, inaugural, opener, inauguration, opened. opening-up, commissioning, open-endedness, inception, initiation, opener, receptiveness, inauguration, breakthrough, editorial, onset, deregulation, liberalising, opportunity. conclusion, solid, juncture, agreement, continuation, misfortune, ending, closure, finish. filler, year-end, seal, blockage, filling, stopper, patch, fill, plug. Opening her eyes at last, she begged that they would kiss her once again. window, fly, fly front, port, intake, rear of barrel, throat, neck, muzzle, outlet, exit, embrasure, neck opening, spout, lunette, gun muzzle, rear of tube, porthole, pass-through, issue, bell, grille, wicket, slit, fenestella, crack, breech, lattice, aperture, gap, interstice, inlet, way out, mouth, hole. window, Ranvier's Nodes, Nodes Of Ranvier, foramen, hole, crack, Diastema, hiatus, crevice, snag, split, breach, fissure, scissure, pocket, chasm, mouth, rent, cleft, rip, rift, tear. move, movement, change of integrity, motion, motility. ceremony, ceremonial, ceremonial occasion, observance.